AMES, Iowa-May 15, 2018– McFarland Clinic announces it will begin seeing patients as its new South Ames Office in the Iowa State Research Park starting Monday, July 23, 2018. 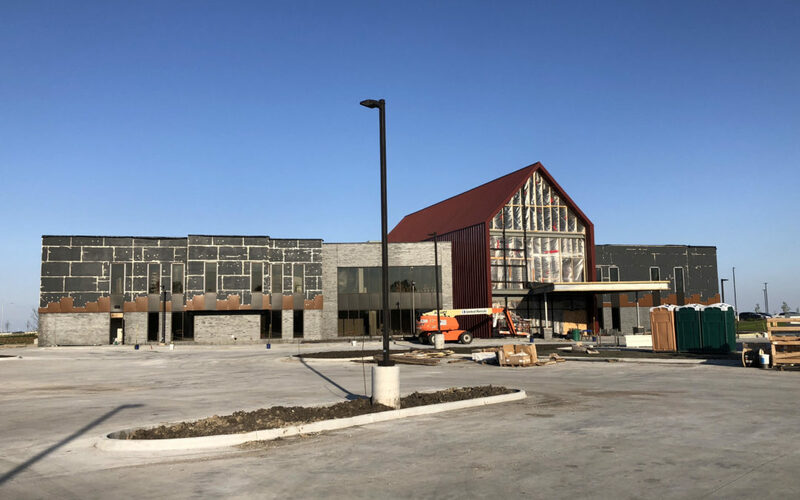 The McFarland Clinic South Ames Office will feature four clinical departments: Family Medicine, Sports Medicine, Optometry, and Physical Therapy. All providers in these departments are welcoming new patients. The physicians providing services at this location include Dr. Sarah Renze and Dr. Sarah Van Hauen. Both are current McFarland Clinic family medicine physicians in Ames and will relocate to the South Ames Office. Dr. Renze and Dr. Van Hauen offer online appointment scheduling as a convenience to patients. Dr. Sarah Bancroft and Dr. Marc Shulman with McFarland Sports Medicine will relocate their practices into this new facility and offer online scheduling. Dr. Bancroft and Dr. Shulman serve as the official team physicians of Iowa State University athletics. The new two-story facility has the capacity to add physicians and expand services in the future. The McFarland South Ames Office will be the 5th location for McFarland primary care services in the Ames community. Currently, 42 primary care providers serve patients in the 1215 Duff Office, Family Medicine East, West Ames, and North Ames Offices. Optometry and optical services will also be featured as part of the McFarland South Ames Office. Physical therapists will provide care to relieve aches and pains and rehabilitation for injuries and surgeries. Laboratory and imaging services will be available at the South Ames Office. “Our Research Park community is expanding, and the importance of offering our tenants amenities like quality healthcare onsite are a valuable component of our ability to continue to attract world class companies and employees. We are pleased to have an established leader like McFarland committed to growing their presence here,” said Steve Carter, President ISU Research Park. McFarland Clinic is central Iowa’s largest physician-owned multi-specialty clinic. A total of 285 McFarland Clinic healthcare providers and 1,000 staff members serve residents in 12 Iowa communities with additional communities served by physician outreach clinics. McFarland Clinic provides easy and convenient access to care with the ability to schedule appointments online with primary care providers at Schedule.McFarlandClinic.com. Patients of McFarland Clinic benefit from a patient portal, MyChart, to access medical records and communicate electronically with the doctor’s office. For more information or to contact McFarland Clinic, go to McFarlandClinic.com.